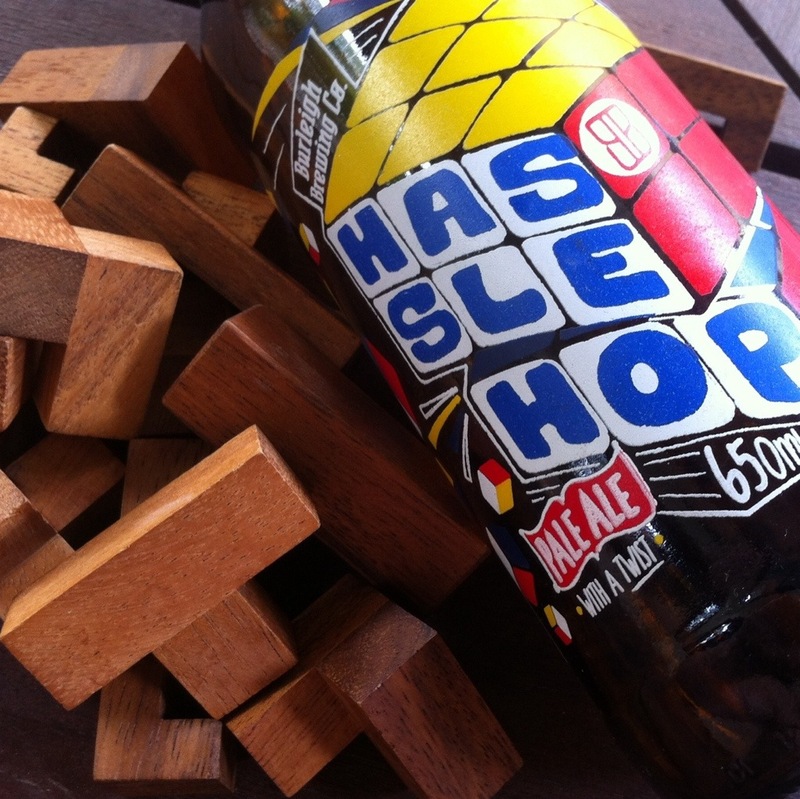 I was recently sent a bottle of the latest ‘Bit on the side‘ offering from Burleigh Brewing Company – the Hassle Hop Strong Pale Ale. This is the bottled version of the beer that Burleigh produced for the Great Australian Beer Spectapular (GABS) in Melbourne earlier this year. It was met with praise from the lucky few who were able to try it then, so now the rest of us have our chance. I guess the name itself represents the ‘Hassle‘ that it was to make all five ‘Hops‘ fit nicely into the beer. Coincidently (or not) this also makes the name very similar to a certain celebrities surname – you know the guy who ran around in red board shorts saving lives, drove a talking car and sang on the Berlin Wall. I’ve got no doubt that many bottles of this beer will be sold based on this connection alone. It’s immediately noticeable that they’ve done something right with the hops here. The first aroma I get is the tropical Galaxy, but that’s probably because I’m pretty familiar with what Galaxy brings to a beer. This is quickly joined by some spicy hop notes and even a little earthy smoke. In fact every time I smell it, it seems that a new hop has taken over; tropical, savoury, spicy, and even a little sweet perfume towards the end. The flavour follows this pattern, except that all of the hop flavours are apparent in each sip. Again it starts with some tropical notes, then there’s a little citrus tang, some spice at the back of the tongue, and then a savoury quality which leads into the bitterness. At least it leads into where you expect the bitterness to kick in, except that it’s nowhere near as bitter as you’d expect. I don’t get much from the malt; it’s obviously in there somewhere but it gets lost in the maelstrom of hop flavours. The flavour lasts as well, like the beer drops the hops off on your tongue so that they can play politely while giving your senses a tickle. It’s definitely complex. It’s definitely puzzling. It’s definitely tasty. With all of these hops flavours playing around, it’s amazing how mellow this beer is. Usually a beer that’s been packed with five different hops is likely to melt your tongue with an epic bitterness. But this beer…this is a lesson in restraint. Tasty restraint. It allows you to appreciate the subtleties of the hops (even if you may not understand them fully) without blowing your head off with a bitter explosion. I’m feeling the need for some hop education myself. Be happy to “research” it with you! I look forward to reading what you two guys come up with. 🙂 And yes I get the “research” part. I’m doing “Brewniversity” at Scratch on the 8th of Feb. Hop varieties is the topic. We should get this “research” underway!